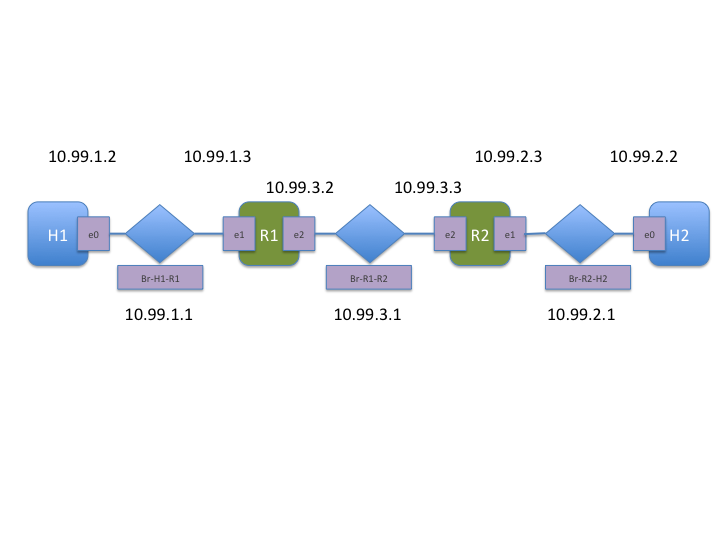 configure BGP/OSPF etc. routes, peering, and other fun things. protocols and ping between virtual hosts connected via virtual routers. translate with a physical setup. Ubuntu 14.04 server installation so that is recommended. Single CPU is OK, but multiple is recommended. Work is in progress to make a docker image and an ISO to ease installation. call for help at the appropriate time. ping 10.99.1.2      # can R1 reach H1? ping 10.99.2.2       # can R2 reach H2? ping 10.99.3.2       # can R2 reach R1? Quagga has a standard, IOS-like looking shell called vtysh. router1 and router2 so that H1 and H2 can reach each other. Congrats on getting this far! You have a working network! to make some progress here.